What: Be among the first to see the History Center’s new permanent exhibition, which highlights little-known episodes and new perspectives of Atlanta’s history. Sit in a vintage barbershop chair, try to lift a laundry bucket like the kind carried by washerwomen who went on strike in 1881, insert yourself into photos of historical events ranging from Freaknik to a circa-1890s Georgia Tech game, even duck inside a recording booth to share your own personal memories. What: Learn more about the Islamic holiday, which follows the month of Ramadan fasting, at this celebration hosted by the Islamic Speakers Bureau. Hear a story about Eid, learn a dance and enjoy traditional music, and make your own crescent moon chimes. What: Cheer as racers sweat it out in the world’s largest largest 10K, which starts near Lenox Square Mall and ends at Piedmont Park. 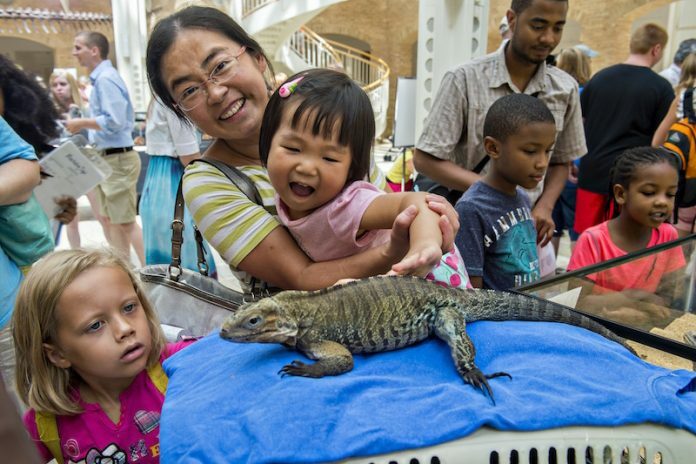 What: Get a close-up view of pythons, iguanas, tortoises, geckos, and more at Fernbank’s popular interactive animal day. What: The Atlanta Lyric Theatre stages the family-friendly Broadway musical from Andrew Lloyd Webber and Tim Rice. The show also plays Gwinnett’s Infinite Energy Center on July 30 and 31. What: Find arts and crafts, live music, midway games, old-timey demonstrations (blacksmithing, corn milling, and, er, moonshine making), and a replica pioneer village complete with a log home, one-room schoolhouse, and mercantile store. What: Relive ‘96 and get your kids hyped for Rio at this anniversary event. Mayor Kasim Reed, former mayor Andrew Young, 10-time medalist Carl Lewis, and members of the gold medal-winning U.S. women’s gymnastics team (aka the Magnificent Seven) will be among those on hand to remember the 1996 Games. Also: Live music, food trucks, an Olympic volunteers reunion, and a fireworks show. What: Her image remains a feminist icon, but Rosie the Riveter wasn’t a real person. Instead, she represented all of the women who marched into the workforce in unprecedented numbers during World War II. Introduce your daughters (and sons) to these women who changed U.S. history as actress Carol Cain portrays seven different “Rosies” in this one-woman show. What: This show—featuring bands and solo artists paying tribute to Swift’s music—benefits the Songs For Kids Foundation, which helps bring music into the lives of children facing serious illnesses. So your teen can reach her #squadgoals by singing along to hits like “Shake it Off” and support a great cause in the process. What: An evil fairy casts a spell on Princess Aurora in this marionette production for ages 4 and up. Bonus: Ticket prices include admission to the Worlds of Puppetry Museum. What: See Shrek, Fiona, and Donkey on the big screen as part of the annual Coca-Cola Summer Film Festival. What: Head to Decatur’s Glenlake Park for an LGBTQ-friendly morning of picnicking, kids yoga, games, and crafts. What: The three-day fest features dance and music workshops, an African-inspired craft market, and a finale concert. Youngsters ages 4 to 16 can attend the Kids Camp on 7/29, where they’ll learn drumming technique and dance moves. What: For the 20th anniversary of the Atlanta Games, the History Center is offering visitors a chance to experience their own Olympic glory. See how you fare at Olympic events (winners will nab memorabilia from 1996), meet real Olympians, and check out the Centennial Games Museum before it closes in August for a major overhaul. What: Watch as 27 of the country’s top-ranked drum and bugle corps strut their stuff on the field. Be sure to cheer for the three local bands competing: the Alliance, the Atlanta CV, and the Spirit of Atlanta, which celebrates its 40th anniversary this year.